Missouri Governor Jay Nixon smiles as he prepares to deliver the State of the State address in the Missouri Capitol in Jefferson City, Mo. on Jan. 28, 2013. (l-r) Mo. House Speaker Tim Jones (R, Eureka) and Lt. Gov. Peter Kinder (R) listen as Gov. Jay Nixon (D) delivers his annual State of the State Address. Gov. Nixon delivers his annual State of the State Address on Jan. 28th, 2013. House Speaker Tim Jones (R) listens as Gov. 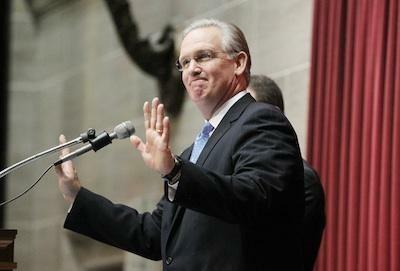 Jay Nixon (D) delivers the 2013 State of the State Address. A panoramic view of the Mo. House chamber as Gov. Nixon delivers his 2013 State of the State Address. 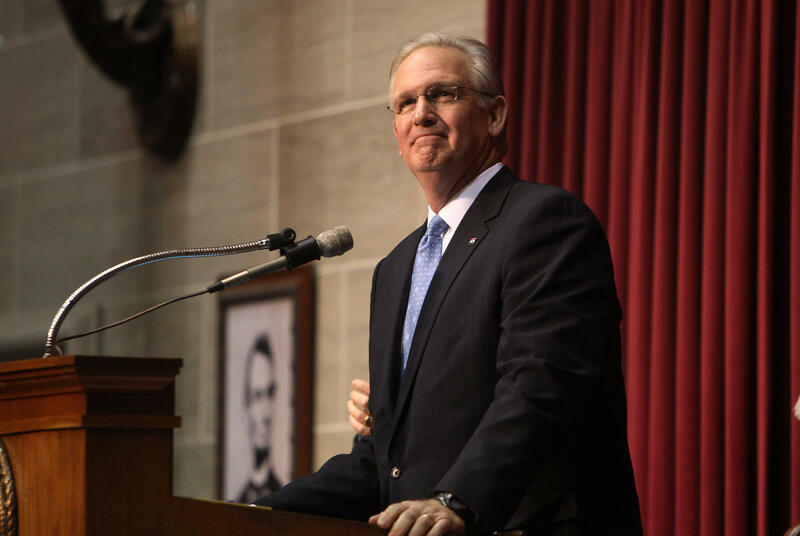 Governor Nixon has been criticized over the past two years for cuts to Missouri’s universities and colleges, including a $9 million cut last year. But this year’s about-face is based on positive estimates of the state’s revenue growth. Nixon told lawmakers he wants to increase education spending by $150 million. The Governor also talked about the length of Missouri’s school year, which he says is too short, and called on lawmakers to add six days to the public school year. The $34 million increase to Higher Education would also come with some conditions – Nixon endorsed tying funding to performance standards, including increased student retention and graduation rates. After the address, Jones called the Governor’s tone on campaign contribution limits too strong, and Speaker Pro-tem Jason Smith (R, Salem) in effect called Nixon a hypocrite for accepting donations much higher than the cap that used to exist. Governor Nixon also announced plans to cut 190 state jobs, which would include some layoffs – and he unveiled four proposed bond issues that would fund improvements to K-12 schools, college campuses, state parks, and the state’s mental hospital at Fulton. Nixon says they would be paid for by reforming Missouri’s system of tax credits. Lawmakers have until early May to pass the state budget. Updated following the conclusion of the address and response 8:25 p.m. Subject to additional updates. Full text of Nixon's address can be found here, and Jones' response here. A significant portion of Nixon's address - Nixon framed Medicaid expansion as an economic issue. "Strengthening Medicaid will strengthen our economy. Without question, it’s the smart thing to do." Nixon also addressed that if Washington doesn't hold up its financial commitment, he supports a provision that "rolls back the Medicaid expansion." Jones called Medicaid expansion a "ploy" from Washington that "forced the hand" of states like Missouri. Nixon proposed an increase in education funding of $150 million - itemized to go toward early childhood education ($17 million), higher education ($34 million) and K-12 classrooms ($100 million). Nixon shared that Missouri's graduation rate is now the 7th highest in the nation. Western Governor's University - Missouri was announced - Nixon called it a "a nonprofit institution that offers bachelors and masters degrees in four areas Missouri’s employers are looking for: business, health care, teacher preparation and information technology." Jones said that he found common ground with Nixon on education reform and that "Education cannot just begin and end at the schoolhouse door." See also: Bonds and "BOOST program"
Nixon announced $10 million toward mental health services. Jones approached the topic by saying that the "solution to prevent such tragedies (Sandy Hook massacre) from happening again in the future does not involve trampling on the Second Amendment rights of our citizens. Instead, we must place an emphasis on creating a mental health system that makes care accessible and effective, so that those who might do us harm have the opportunity to receive the kind of help that can put them on a path to triumph rather than tragedy." Nixon proposed a 29 percent increase in funding for domestic violence programs and facilities. Jones did not address the topic in his response. Nixon proposed the "BOOST Fund" - stands for "Building Opportunities in Our Schools Today." Also proposed bond issuance for Fulton State Mental Hospital and the refurbishing of state parks and elements of tourism. Proposed paying for bond system with tax credit reform. Jones addressed tax credit reform by saying: "We also believe it is important to review the effectiveness of our existing state programs, including Missouri’s 61 tax credit programs. Many of these programs accomplish a worthwhile goal, but oversight and accountability are required." Nixon called "unlimited sums of money pouring into the campaign accounts of candidates seeking office" "the single most destructive force to our system." Nixon said that if the legislature doesn't send him a campaign contribution limit bill to his desk, he would do "everything in [his] power" to get it on the ballot and make sure it passes. Jones did not address this topic in his response. Nixon did not address transportation in his address. Jones said: "Areas like the critical task of improving our state’s aging and failing infrastructure. We must work together to make sure our roads and bridges, the essential transportation routes vital to economic development, are maintained, repaired and, when necessary, rebuilt." Nixon did not address this topic. Jones spent a considerable portion of his response on the topic and called it one of his "top priorities." He called for reform of the malpractice system so we "can close the floodgate of lawsuits that threaten to drive the cost of medical malpractice insurance through the roof and, of course, increase the cost of care." Tonight, Missouri Governor Jay Nixon delivers his annual "State of the State" address - and the Republicans will give their response. Not only will we be broadcasting both of these events live starting at 7 p.m. but we also open up our live chat to you. Pose a question, share a comment, challenge a point. It's all up to you. Join us on-air at 90.7 FM (or streaming live online/mobile) and bring all of your thoughts here to our live chat (below). See you here tonight! What's Gov. Nixon expected to speak about tonight? Check out our preview of the address here. As you might expect, lawmakers are hoping that the governor will address areas specific to their constituents’ needs. Democratic Senator Maria Chappelle-Nadal of University City hopes Nixon’s proposed budget will not overlook the needs of women and minority small business owners. “For the last 16 years, we have not had a disparity study, so there are many minority and women-owned businesses that are out there right now who are not getting the benefit of being able to contract with the state,” Chappelle-Nadal said. Chappelle-Nadal also commended the Governor for his pursuit of Medicaid expansion. Some Republican lawmakers, meanwhile, say they’ll carefully examine any budget cuts the Governor may propose, in light of last week’s revelation that the Missouri Highway Patrol spent more than $5.5 million on a new airplane to transport the Governor and other elected officials around the state.